At just $279 for early Kickstarter backers, the Model C is practically an impulse buy. This Picobrew machine also makes sanitization even easier. In their forward march to make a truly affordable, newbie-friendly beer-brewing appliance, the folks at PicoBrew have just announced the Pico Model C, another kitchen countertop model that works with PicoPaks filled with the grains and hops of your favorite commercial beers. The new machine should be even easier to work with than the current Model S, but perhaps its kindest feature is its price: The Pico Model C launches on Kickstarter for only $279 to early backers, and will sell for $549 when it hits full retail in the fall. 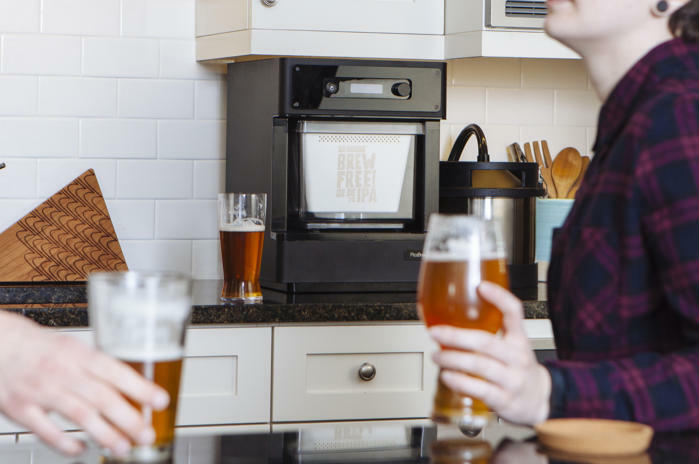 We’re generally wary of covering Kickstarter projects, but Picobrew has a proven history of using crowdfunding feedback to improve its products, reaching all the way back to the original PicoBrew Zymatic, which I gave 4 out of 5 stars. 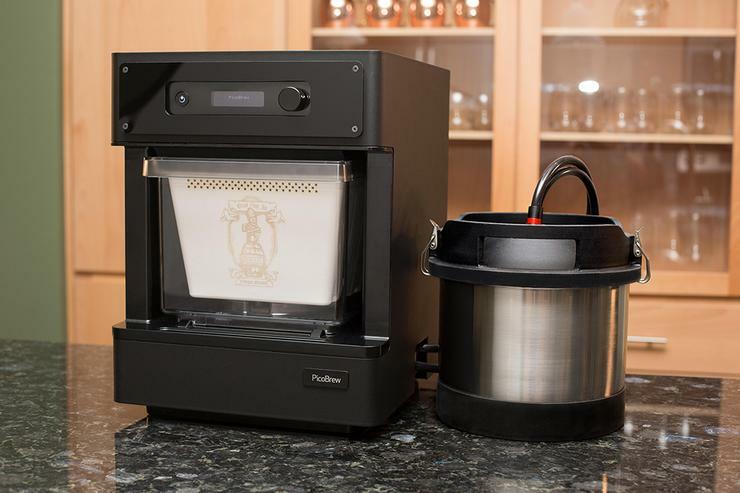 The Pico Model S currently sells for $799, but by dropping its stainless steel case for a sheet-metal, black powder-coated exterior in the Model C, PicoBrew was able to create a less expensive product. PicoBrew also realized cost savings with an entirely new type of brewing keg that eschews traditional Cornelius keg ball locks. The new design obviates the need for wrenching off your keg posts, and makes sanitization easier too. Brew Free or Die IPA? That’s a 21st Ammendment recipe, and they’re literally next door to our PCWorld/TechHive offices. Mitchell told me these new kegs are less than half the price of the Cornelius kegs that are so familiar to home brewers, and assured me the new kegs (and all their associated parts) can be sanitized with a hot-water cycle in your dishwasher. Like the Model S, the Model C uses PicoPaks that come pre-filled with grains and hops of popular commercial beers (they even have an IPA from our next-door neighbor, 21st Ammendment Brewery). You can also design your own beer recipe using the BrewCrafter tool on the BrewMarketplace at picobrew.com. Picobrew’s BrewPulse app includes instructional videos, information on your brew’s progress, and direct links to order more pre-packaged PicoPaks. But with the Model C, PicoBrew is introducing BrewUnlimited, a PicoPak “subscription service” that evokes the days when we used to receive Netflix DVDs in the mail. For $59 a month, you can order as many PicoPaks as you want, just as long as you only have two unbrewed PicoPaks in play. The upshot: If you’re willing to stock up on fermenting kegs, you can have a virtual brewery in your basement. BrewUnlimited includes free shipping, and applies to the “FreeStyle” PicoPaks that you design yourself. Finally, PicoBrew is making even more progress in simplifying the entire beer-brewing process for beginners. 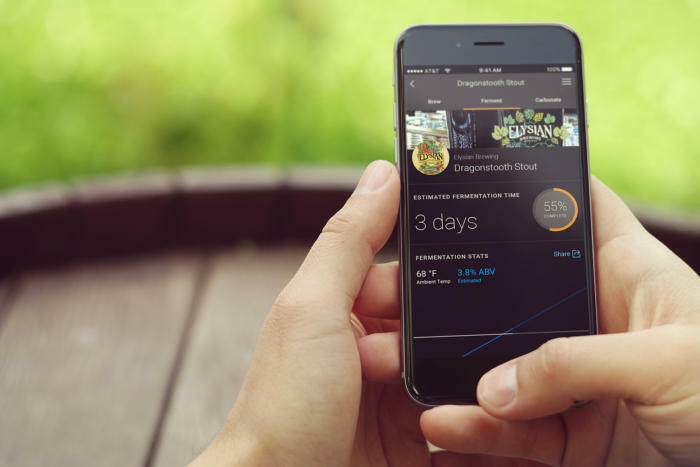 A new BrewPulse app for Android and iOS includes videos of key steps in the brewing process, and has a function to track fermentation and carbonation times. Both features should be a real boon for first-time brewers. Unlike the original Zymatic, which racked finishes beers to a 2.5 gallon Cornelius keg, the Model C uses 1.75 gallon C kegs, and racks beer to a 5 liter finishing keg. That’s less beer for your effort, but the smaller kegs fit better into your kitchen refrigerator. The smaller brew sizes may also compel Model C owners to explore many more brews over time. For full details of the Pico Model C, check out the Kickstarter. The campaign is just an hour old, and already has $111,000 of a $350,000 goal.